This article is about the notorious pirate. You may be looking for the Pumpkin King. A pirate who sails the high seas. He sure is a colorful character, and one who really values his freedom. He says he's a captain, but he doesn't seem to have a crew. Jack was arrested in Port Royal and thrown in jail, but Will Turner helped him escape during a pirate attack. Jack seems to know something special about Will's name. Wonder what it could be? A legendary pirate, and captain of the Black Pearl. We know Jack well from our past adventures. After we parted ways, Jack was devoured by the Kraken and sent to Davy Jones' Locker, where our paths crossed again. "Captain Jack Sparrow, if you please." Captain Jack Sparrow is a crafty and potentially dangerous pirate who inhabits Port Royal. After being freed from jail by William Turner, he sets off to reclaim his stolen ship, the Black Pearl, which was taken over by Captain Barbossa. Upon meeting Sora, Jack becomes available as a party member, and fights alongside him during both Port Royal visits. He eventually falls under the curse of the medallions, and has to break free from its spell. He made his first appearance in Disney's Pirates of the Caribbean: The Curse of the Black Pearl. Jack made a deal with Davy Jones, who raised the Black Pearl from the depths of the sea and let Jack be the captain of it for thirteen years. In exchange, Jack promised Jones his soul. However, after three years, Barbossa lead a mutiny against Jack and took the Pearl from him along with his crew. As a result, Jack believed that he gained some extra years free from repaying his debt as he did not have the Pearl and was not captain of it. Despite all this, he would always refer to himself as a 'captain" when introducing himself. Jack Sparrow was arrested for piracy on Port Royal while attempting to steal a ship to go after the Black Pearl. After Barbossa kidnapped Elizabeth Swann, Will Turner reminds Jack of the debt for freeing him, so the two, together with Sora and gang, hijack the HMS Interceptor to go after the Black Pearl. While Sora and gang had to stand guard, though they worried the two couldn't fight the Heartless, Jack and Will infiltrate the cave on Isla de Muerta, where a ritual is underway with Elizabeth, whose blood Barbossa believes will break the curse. Mistrusting Jack, Will knocks him unconscious. He rescues Elizabeth, and the two escape to the Interceptor, with Jack captured and tied to the mast on the Black Pearl. After a fierce battle between Sora's gang and the Undead Pirates, the Interceptor crew is captured. After learning Will can break the curse, Barbossa left some Heartless and kegs of lit gunpowder to leave Sora and gang to their fate. However, the heroes managed to overcome the odds and returned to the island and rescued Will. Jacks walks into the moonlight after being stabbed, preventing his death. Jack more than matches the ruthless captain blow for blow. While Jack is momentarily distracted, Barbossa impales him with his sword, believing he is mortally wounded. However, when he stumbles backwards into the moonlight, Jack is revealed to be under the curse, having sneaked a coin from the chest to curse himself while Sora and gang dealt with Barbossa's cursed crewmen. Jack and Will lift the curse just after Jack fatally shoots Barbossa with the shot he has carried for ten years. No longer immortal, Barbossa falls onto the ground, dead. Though Will offered his hand to Jack, he took a step back in fear Will might hit him again. Jack's compass was then used to open up new routes with Sora's Keyblade. On Sora's return trip to Port Royal they discover that there are still cursed pirates in Port Royal. Jack and his crew journey to Isla de Muerta aboard the Interceptor, saving Will from a certain death, and on the way come across a member of Organization XIII, Luxord, who has stolen the chest with the cursed medallions and summons a giant Heartless to fight them. Upon defeat, Luxord calls for parley by throwing out four pieces of treasure to Gambler Nobodies and destroying the Interceptor with the Black Pearl's armament. After landing in the Ship Graveyard, the crew discovers that the curse has come back to Jack. The group hunts down the four stolen medallions, and eventually find them. Sora's Keyblade disappears from Jack's hand and returns to Sora. Back at Port Royal, Luxord is there waiting for them to return the treasure. After it is returned, he summons the Heartless from before who is now under the curse. When they return the medallions, the curse on the Heartless lifts, but Jack's skeleton form remains. Goofy immediately realizes that Jack has been put under the Heartless' spell rather than the gold's curse. After the Heartless is defeated, the curse is lifted for good. The chest is then dumped into the sea to ensure that the curse does not ever resurface. As a reward for his trouble, Jack asks for Sora's Keyblade. Knowing the Keyblade would return to him, Sora agrees to it. When it vanishes back to Sora's hand, though, Jack is not surprised. Jack vows to one day get a bloodthirsty crew together and steal the Keyblade. Sora, Will, and Elizabeth comment on Jack being the best pirate in the Spanish Main, as well as the whole ocean. After the defeat of Xemnas, Jack, Will, and Elizabeth are shown on the Black Pearl. As Jack sails, the moon comes out and he checks his hand, still remaining human. He pulls something out of his pocket and kisses it, implying that he has kept one of the gold pieces, now no longer cursed. Some time later, Jack failed to repay his debt to Davy Jones. This has resulted in Jones sending the Kraken to devour him, causing both Jack and the Black Pearl to end up in Davy Jones' Locker. As Sora, Donald and Goofy chase the Black Pearl in Davy Jones' Locker, they reunite with Jack who was also going after the ship. The group of four later reunite with Elizabeth, Will, Joshamee Gibbs, Tia Dalma, and a revived Barbossa. They become separated after Heartless attack. Jack strikes a deal with Beckett. The real Jack negotiates with Cutler Beckett. Beckett wants Jack to divulge information about the Brethren Court, such as where they will meet and their plans. In exchange, Beckett claims he can guarantee Jack's freedom, give him fair compensation and square his debt with Davy Jones. A fake Jack created from crabs by Tia is used to assist Sora, Donald and Goofy. After helping defend the trio from Luxord and collecting plenty of crabs, the fake Jack disappears after revealing the truth, although tells the three where the site of a pirate showdown will occur. Jack breathes in Luxord's face, knocking him off the Flying Dutchman. On a small island, Jack, with Elizabeth and Barbossa at his side, meets with Davy Jones, Will and Beckett. Jones still does not consider Jack's debt to be paid and tries to force Jack to become his slave for a hundred years on the Dutchman. Elizabeth tries to exchange Will's slavery for Jack's which works. During the final showdown, when the Flying Dutchman is under invasion, Jack turns against Jones. Jack also manages to defeat Luxord using the power of his breath. When everything is peaceful, Elizabeth thanks Jack for his efforts. Sometime after Xehanort's defeat, at Port Royal, Jack and Gibbs spot a ship in the distance. Sparrow's trademark physical characteristic is a slightly drunken swagger, accompanied by slurred speech and awkwardly flailing hand gestures that make him appear unfocused. Despite the constant scheming and lack of honesty which result from his self-serving nature, Jack adheres to the "Pirates' Code"; though he slightly adapts Barbossa's belief they serve as guidelines and considers the Code on a "need-to-know" basis. A common theme with Jack is he will tell the truth, only to be met with disbelief; he also tends to word things in such a convoluted manner, that it seems like he's talking gibberish. He believes pirates can still be "good men", seeing the Heartless and Organization XIII causing trouble give real pirates a bad name. Though both deny it, Jack and Sora have similar personalities. He also prefers to be called "Captain Jack Sparrow" or "Captain Sparrow". While he may not admit it, he does consider Will and Elizabeth friends; he even says they are made of strong stuff, knowing they can endure the ten year separation. Jack Sparrow is a tan, mustachioed man who wears his dark brown hair in dreadlocks decorated with numerous beads. His beard is similarly styled into two smaller dreads, each with two very small beads near the tips. Jack wears a faded red bandanna on his head, on which is another small beaded ornament ending in a silver coin. He wears brown boots and has brown eyes, and carries a the scabbard of his cutlass on his left hip, kept in place by a black strap that goes over his right shoulder. He wears another tan belt around his waist, over a tattered, white piece of cloth tied around his waist. Jack's compass hangs from this second belt, tied on by a piece of twine, and his pistol is tucked into the cloth. He wears a faded, loose white shirt underneath a black jacket that exposes his chest, both tucked beneath the cloth and belt. The legs of his black pants are tucked into his boots. Jack sports a fingerless glove on his right hand. Strangely, in Kingdom Hearts II, Jack doesn't wear his hat, even though it was repeatedly shown to be precious to him in the films. Under the effects of the curse, when under moonlight, Jack's body becomes that of a rotted skeleton. Though more or less the same, Jack's clothes become far more tattered, to the point that he altogether loses most of the legs of his pants. His skin becomes grey and rotten, and the decay of his lips exposes three gold teeth in the front of his mouth. Jack is primarily an offensive party member, using his sword to attack in addition to bombs and knives. As such, his fighting style is somewhat similar to Aladdin's, although he is slower and has the aforementioned projectile attacks. Jack has one armor slot, one accessory slot, and four item slots. Jack has an action ability for each of the weapons in his arsenal: No Mercy is his sword attack, Rain Storm throws knives, and Bone Smash involves bombs. His limit, Treasure Isle, involves Jack summoning a treasure chest that creates a trapping vortex before Jack and Sora devastate enemies through melee attacks and explosions. Additionally, Jack has a number of support abilities, including Draw, Lucky Lucky, Item Boost, Defender, Auto Limit and Auto Healing. Top: Jack Sparrow in Pirates of the Caribbean: The Curse of the Black Pearl. 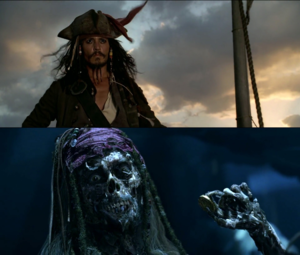 Bottom: Jack Sparrow under the curse in the original film. 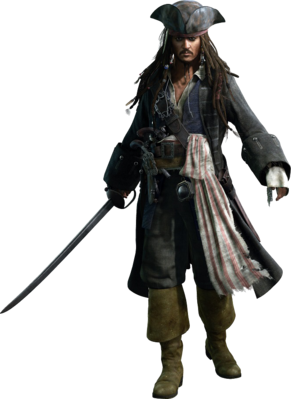 The character of Captain Jack Sparrow originally appeared in the 2003 film Pirates of the Caribbean: The Curse of the Black Pearl, played by Johnny Depp, and is the central protagonist of the franchise. As such, he appears in all of its sequels, Dead Man's Chest, At World's End, On Stranger Tides and Dead Men Tell No Tales, battling foes such as the legendary pirates Davy Jones and Blackbeard, who rival his buccaneer exploits, as well as agents of the law like Cutler Beckett and Armando Salazar, who seek to imprison or take revenge on him.